The StingRay turntable anchor kit provides an uncomplicated way to attach and properly position wash loads on the parts washer turntable. Steel fixture posts slip vertically into square steel sockets welded to the turntable accommodating mounting of a wide variety of components for washing. Strategically located expanded metal screen forms pocket in Turntable so that one end of a shaft or similar long part can be placed in pocket and the other end on a steel post. Long parts are held in diagonal position allowing washing of parts longer than working height of Parts Washer. Used to stand-up head or other parts on turntable for washing. 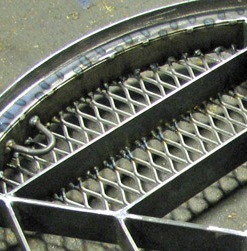 Hooks and loops at the turntable perimeter provide numerous locations for tie-down of parts or baskets. All steel construction.